Write up by Sri Sampath Kumar Swami: To day it is a very auspicious day. 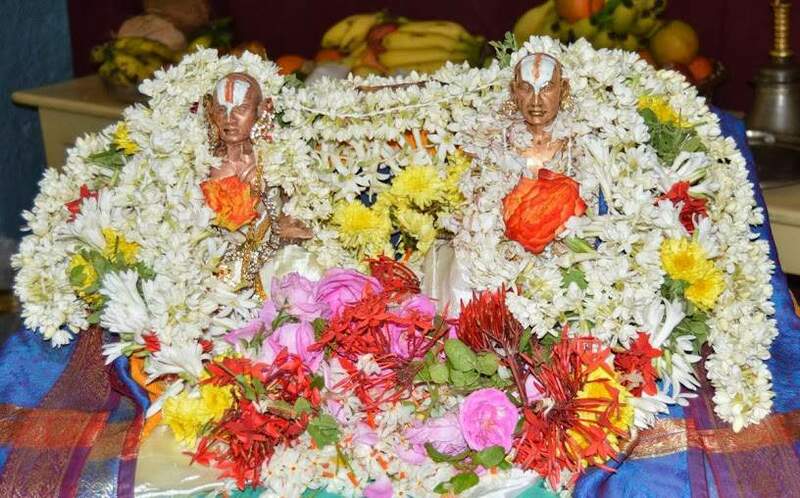 First ,Thirumangai Azhwar & Sri Nampillai Avathara Dhinam. For thirumaligai sishyas today happens to be yet another great auspicious day which is our Peria Swami's (Kumara Venkatachaar) Thiru Nakshtra Day too. - As usual Sri Praveen Swami of Triplicane and his band of dedicated team organized this years Thiru Nakshtra Day at Triplicane. - About 500 of our Sishyas and Abhmanis took the Blessings of our Kumara Venkatacharya Swami. - Koil Mariyadhai from Sri Partha Sarathy Perumal Koil (Triplicane), Varadharaja Perumal Koil (Kancheepuram), Mudaliandan Swami Avatharasthalam (Nazarethpettai) etc were received with due respect. - The hall was full with a large number of Goshti in which Adhypakha Swamis from Triplicane Koil were present. - A silver Kudam costing about 2 lakhs was donated to our Thirumaligai. Only six such Kodams have been made by GRT and our thirumaligai desired to have one and this was fulfilled by few sishyas in Triplicane. - Ammangar, Chinna Swami and Chinna Ammangar were present along with our Varthamana Swamy and blessed every one. - Every sishya prayed to Periya Swamy, Thirumaligai Perumals for the welfare of Varthamana Swami and his family and were looking forward for more participation by Chinna Swami in Thirumaligai Kainkaryam.